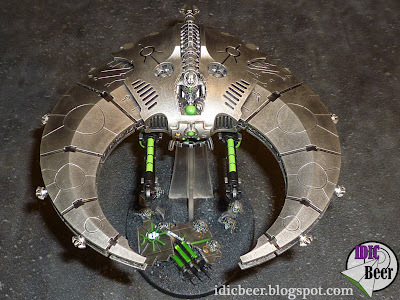 So, are the new Necron Flyers totally designed for 6th edition? We know that Flyers are going to have their own rules in the book, and as GW will want to sell lots of them, they probably are going to be half decent. As it stands now though, and with my interchangeable Scythe all painted up, I have been trying to work out the best way to use them in 5th, while it's still with us. So what about the Night Scythe? Well, it still suffers from the same problems as the Doom Scythe, but instead of the rather short ranged and random Death Ray, you can transport robots in it. The question is, what to put in it? If the Scythe goes down, any unit that is inside automatically goes back into reserve, which is a brand rule for a 40k vehicles and one that I welcome to my army, because it makes it different. The only real way to counter the weak AV11 is to have more than one model for unit redundancy, but at this moment in time, I only have one of these beauties, and need to come up with a plan to be able to use it. As Embolden 40k talked about, we will usually all have a deckchair unit in our army, a weak unit of troops that is designed to sit in the sun holding an objective, or to reserve and come out onto an objective when available. So, if we put our deckchair unit of Warriors or Immortals into a Night Scythe, and the Scythe stays alive for two or three turns, we will be keeping our deckchair unit off the table and alive. The Scythe can be used as a distraction unit, moving fast to gain a good position and cover saves first turn, and then open up its guns for as long as it can thereafter. I am sure the Scythe will get some attention and will at some point go down, probably in turn two or three. Now your nice and safe deckchair unit goes in reserve, and can come on turn four or five to capture your rear objective, just as if you were using a piece of wargear to delay them! I like the deckchair battle plan. Only down side to it is you are planing on it getting taken out or able to move in the late turns to drop the unit where you need it. It dose let you run it fast and close the the battle but in kill point/ VP games your deckchair's transport is a give me point. Still i like it and will look to see if it will fit into my lists. Thanks, yeah if you get immobilised your stuffed lol. Hopefully you will have enough other troops to fall back on though if it happens. I think I would use the Eldar tricks in annihilation missions, reserving, moving fast for cover saves and only taking shots if your not going to get shot back. 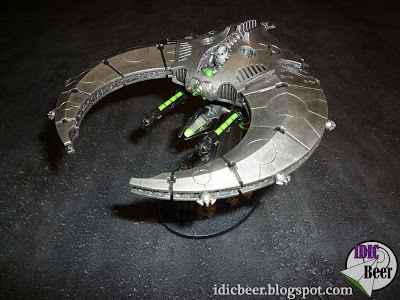 I totally agree with you, that the Doom Scythe just doesn't work at the moment, after playing a game against 3 last week (battle report up shortly), I think being a flyer in 6th ed you'll need a 6 to hit it making it quite survivable, unless you have a special ability that ignores the flyer rule. I'm interested to see how the Night Scythe does, being used as a late game objective holder/contester seems are really solid strategy, I would like to see it teamed with a couple of Ghost Arks and that in reserve to come on late game and capture an objective 36" away! This will make the whole army incredibly hard to stop in objective games.